I’m a fan of rogue-likes, but I prefer more of the Chunsoft line of games, “Torneko: The Last Hope”, “Shiren the Wanderer”, and to some extent, the Pokemon games too. Never played the Chocobo one. I like these more for the non-perma-death, RPG-stat-building and the constant progression. I love the simple gameplay, with the deeper game mechanics and strategy. I also don’t shun away from the more brutal rogue-likes, and in my search for a iOS “Torneko” or “Shiren” game, I’ve played and enjoyed a couple. “Dungeons of Dredmor” was not one I enjoyed. “FTL” I did. 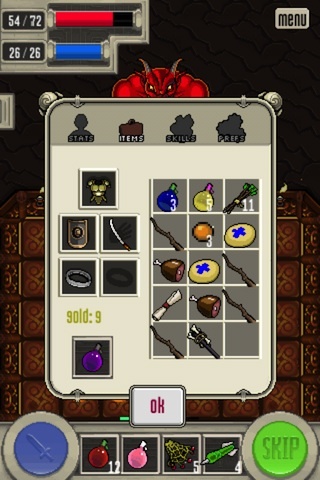 “Hack Slash Loot” I did for a bit, but it got old too fast (lack of deeper gameplay). “Legend of Yore” was a bit too simplistic for my liking. 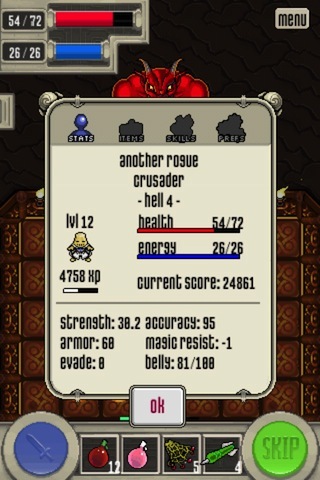 “100 Rogues” for the iOS grew on me. When I’m not on WiFi, relying on Sprint 3G network for gaming makes me want to scratch the surface of my phone in frustration. So SLOW. So when I was at the doctor’s office recently, I decided to play “100 Rogues”, a game that didn’t rely on a network connection to enjoy. I continued from a game I started some time ago. 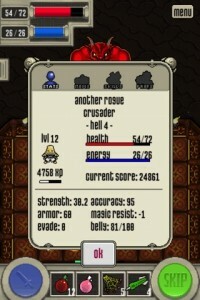 I only remembered dying a dozen times in the past with different characters, but this game was my first as the Crusader. Apparently I was on the 3rd floor, with no recollection of how I attained my levels, other than rushing for the heal spell. Found a cool +2 sword. Sweet. I can’t use a bow, but I can throw arrows at the enemy for minor damage. Wow, a boss?! Invulnerable shield?? Oh, this is easier than I thought. Wow, found a better sword! Does less damage, but is more accurate and stuns! Hopefully my new passive skill kicks in. I haven’t seen it work yet though with my other sword. Bugged? Sweet, armor! Let’s get out of these robes and wear something more fitting for a Crusader! Hey, my passive finally kicked in! 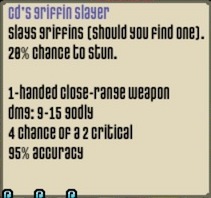 I do an extra damage with my “Griffin Slayer”. Oh, a Tower shield. That armor passive is finally useful! Anyways, I got hooked. My “cd’s Griffin Slayer” was doing respectable damage and I felt unstoppable. 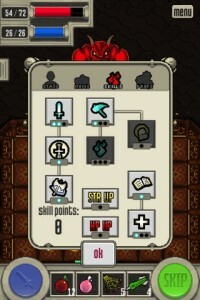 Then I got to another boss floor, and faced Satan! He would torch the entire room, summon Vampire Bats and his melee attack would knock my Crusader out of melee range. 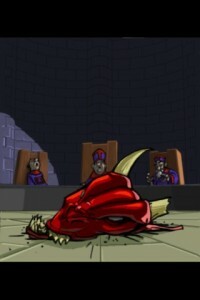 However, Satan couldn’t do enough damage to really threaten me, and I had my Heal spell to fall back on. I also had Health potions as another back up. The Vampire Bats Satan spawned would drop Health potions. In fact, I came into the fight with only 4, but the screenshots reflect those picked up from the bats. The problem though is that I couldn’t do enough damage to negate his health regeneration each round. 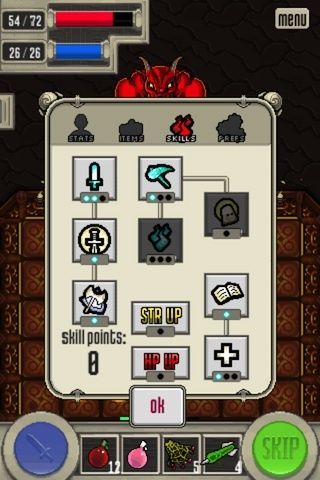 Even when I landed a critical for 90 damage, Satan would heal to full after that! This went on for a while and I felt like I hit a stalemate. My weapon passive even triggered once or twice during the fight. This happened once in “FTL” as well against its boss 😛 There must have been some trick to defeating Satan, so I turned to the internet for answers. Apparently, in order to win, you have to fail. You have to die in order to “beat” Satan. It still doesn’t make sense to me. After dungeon crawling and building up my character, I want to see him unleash death and uber destruction on the denizens of hell! Or at least eek out a close win. Or get owned by Satan and prove to me that my character was not yet worthy of the challenge. Instead I was locked in a staring contest with the final boss and expected to sit idle and die. To be fair, though unconfirmed, Satan has a hidden set of health that you are to deplete before you “die” in order to defeat him. Other players actually do die trying as they pile on as much damage as they can. My Crusader on the other hand, actually had to stop playing and skip turns in order to die. I think unequipping his armor and shield would have sped up the process, but that would be counterintuitive to how you’re suppose to play the game.